I wrote this post and the internet deleted it. That's the most I need to quit writing. I was up until FOUR AM writing that post. I promise you I don't have enough energy on a Sunday evening now to re-write it with the same vigor. 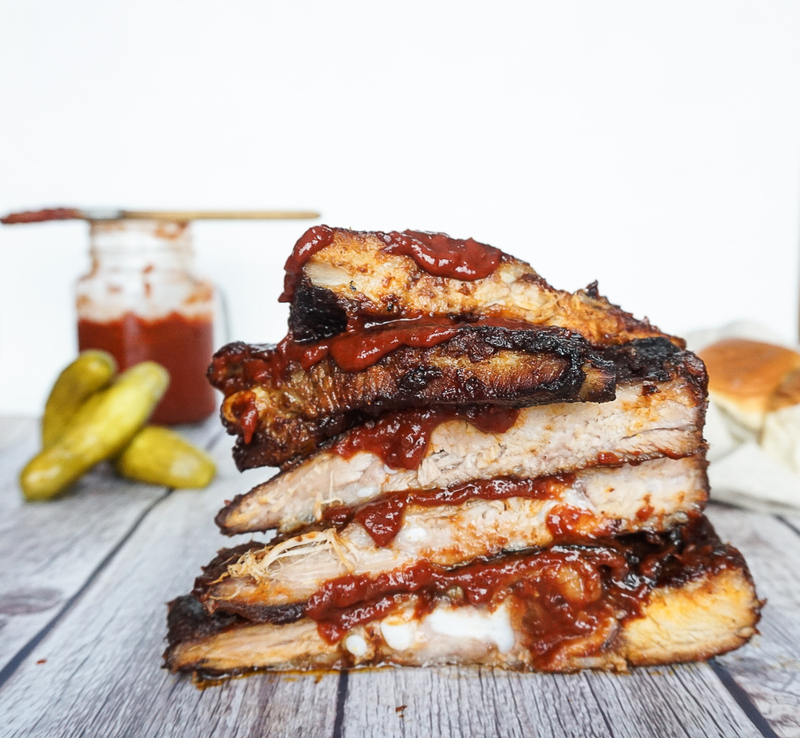 So we're going to cut to the chase because I couldn't possibly leave you hanging with a gorgeous recipe for BBQ sauce and not give you anything to slather it on top of. So here it goes, a dry rub recipe is included here. Indirect cooking is the way to go, even after a sous vide cook. These ribs are a real delectable treat even if they do require one day of planning ahead, they are *easy* because the 12 hour cook time requires so monitoring of any kind. You can quite literally sleep through it. Thanks so much sous vide, you're the best. If your ribs are falling off the bone - here's a shocker, they're overcooked. This beauty of a sous vide cook does not tolerate over cooking but the meat peels away from the bone with a gentle tug. Absolutely perfect. I have a a gas grill, there's little smoke imparted in the cook when you don't use charcoal, but a good grill cook is possible. I use liquid smoke to enhance flavor but you can use a "smoke bomb" to help build layers of flavor here if you'd like. Note: I generally use less salt than usual when I sous vide cook because there is no 'fall off' in this method of cooking. Salt stays in the bag for countless hours, use salt according to taste or adjust in afterward. This was perfect for me! Start here and make amendments later. Many dry rubs use nearly as much salt as they do sugar. Mix all ingredients together well in a small bowl. Cut membrane from the back of the ribs, if not already done by the butcher. Rub spice mix into pork ribs, between the bones and any flaps of meat. Wrap tightly in cling wrap and store in the fridge for one hour but not more than four hours. 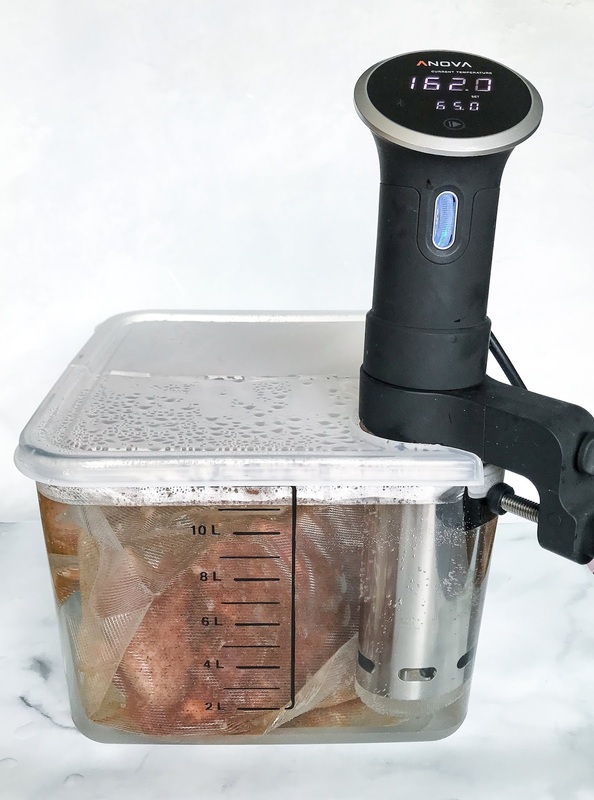 In an airtight bag, or using the water displacement method bag up the seasoned ribs and submerge in water at 165* degrees for 12 hours. Make sure you do the extremely simple math and you don't submerge the meat at 3pm, because that means you have to wake up at 3am in order to douse meat in an ice bath. All my silly mistakes are teaching moments to help you. Set up water bath in the evening so that when you wake up you can move the sealed bags into an ice water bath to stop the cooking process. After 12 hours at 165* degrees, submerge ribs in an ice bath for 10 minutes to stop cooking. Store in the fridge until ready to cook. Using indirect heating method light 1/3 or half of your grill, depending on how it is set up. Close the lid and allow the grill to reach 350* degree temperature. While waiting for grill to preheat, unbag the ribs and blot dry with a paper towel. On a well oiled grill, place the ribs, bone side down, on the cool side of the grill - the side without the working open flame. Close the grill and allow the ribs to warm for ten minutes. Baste the ribs with Cherry Chipotle BBQ sauce and flip onto the hot side of the grill, baste the rib side of the grill with BBQ sauce generously. Close the grill and allow the sauce to dry down for about 5 minutes. Open the grill and baste the ribs, flip, and baste again. At this point the BBQ sauce should have a bit more of a sticky sheen to it. Add 1-2 more coats to each side and remove from the grill, don't exceed 25 minutes on the grill. 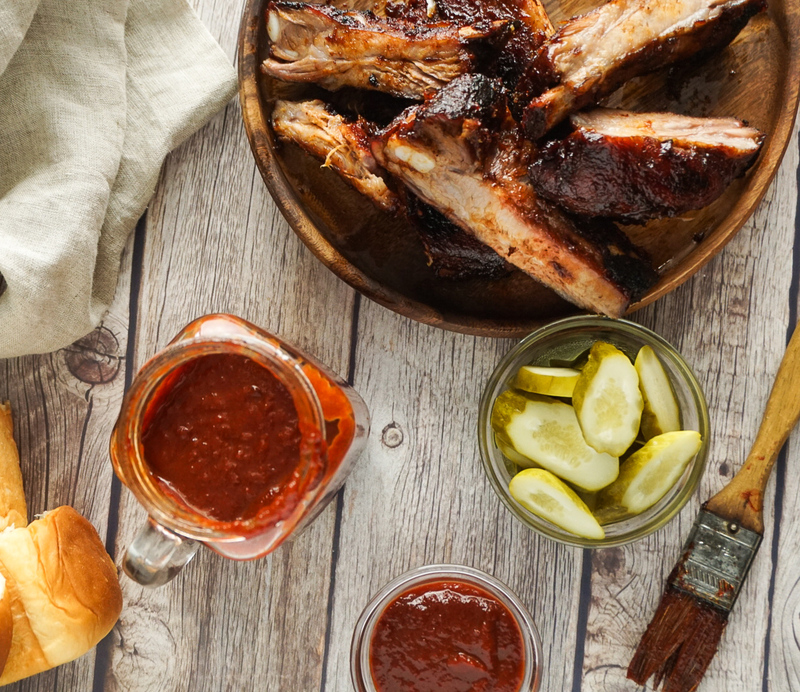 Serve ribs with a side of extra sauce, kosher pickles and sweet bread. Avoid chomping on your own fingers to get to the BBQ sauce because I assure you the super tender rings are far more delicious.